Confined to a hospital bed, an accident victim is menaced by a sinister presence. A dingy hospital setting. A protagonist confined to a bed, helpless and vulnerable. A distinctive and monstrous villain. It all sounds like the makings of a classic piece of low budget horror, maybe even a franchise starter based on the continued exploits of its titular meany. But sadly director Dennis Bartok's Nails squanders all three of the key elements that should have ensured its success. The movie's one real asset is The Descent's Shauna Macdonald, who plays Dana Milgrom, confined to a bed - in the most badly run and understaffed medical facility in the British Isles - after being hit by a car while jogging. Not only is she unable to move below the waist, but a hole in her throat means she can only communicate through typing words into a voice replicator. On her first night after awaking from a coma, Dana swears someone is in her room, but the hospital's one and only porter (??? ), Trevor (Ross Noble), assures her it's not possible, as none of the patients on her floor are in any condition to leave their rooms. Yet each night, Dana finds herself menaced by a presence, first unseen, but gradually revealing itself as 'Nails', the ghost of a former staff member who killed himself after murdering five children. With Nails appearing only to Dana, can she convince her skeptical husband (Steve Wall) and the hospital administration of the danger she faces, or will she be declared insane? 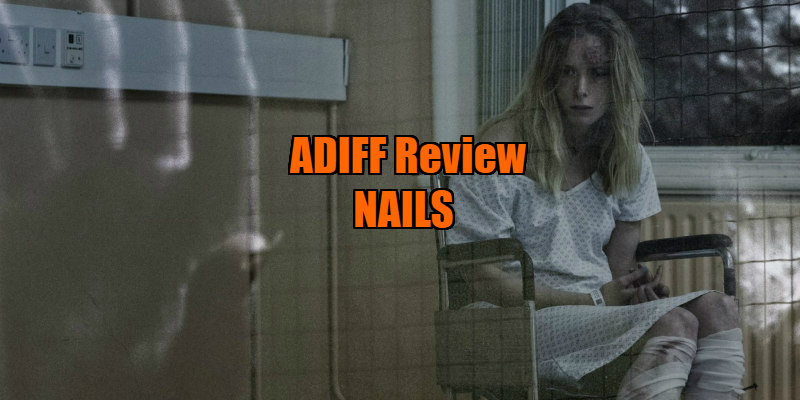 Nails follows a narrative structure not unlike Paranormal Activity, with the terror coming at night and our protagonist spending her days trying to figure out a way to end it. In terms of quality, these sequences are literally night and day. The set-pieces in which Dana is harassed by the eponymous demon are quite effective, thanks in no small part to Macdonald, who really sells her characters unenviable predicament. Nails himself is an effective combination of special effects and makeup, and is a nice change from the derivative demons of most low budget horrors. Bartok's tracking camera exploits the dark recesses of the hospital corridors. The trouble is, these sequences are framed by daylight scenes that feature some truly awful writing, with Nails' backstory revealed through crude dialogue and blunt exposition. Actors are forced to speak some downright embarrassing lines, and Macdonald can count herself lucky that her character is rendered mute for most of the movie. A subplot involving her husband's affair with a younger woman is communicated so awkwardly it's cringeworthy, and like so many bad horror movies, characters behave in the most unrealistic fashion when faced with threats. Visually, Nails is a cut above most UK and Irish horror, with cinematographer James Mather making nice use of light and shadow, and director Bartok shows promise in the film's key moments, but this badly needed rescuing in the script department to sell its intriguing premise in convincing fashion. 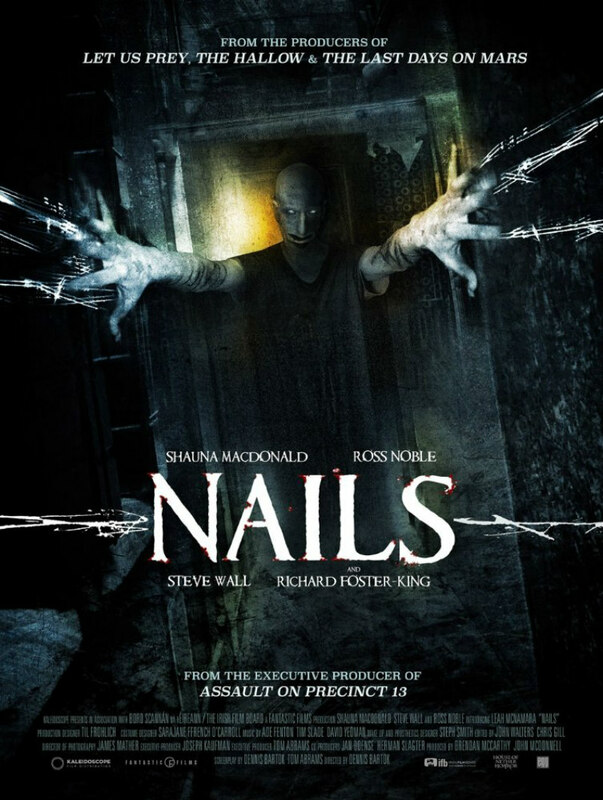 Should you choose to watch Nails, you may find yourself slipping into a coma. Nails played at the Audi Dublin International Film Festival. A UK/ROI release date has yet to be announced.